« 10/26 Has Louisiana already missed the boat on sports betting? It’s something Dennis Hendricks couldn’t stress enough at the 2018 Global Gaming Expo in Las Vegas. In fact, during his panel discussions it’s something that rarely seemed to leave his mind. Hendricks, treasurer of the California Nations Indian Gaming Association (CNIGA) and a member and former chairman of the Tuolumne Band of Me-Wuk Indians, repeatedly warned of an impending erosion of the tribal compact in the state by card clubs seeking to expand their action in an increasingly competitive market buffeted by hardball politics and a midterm election. It’s a point California’s tribal leaders have rallied around for years after noticing what they considered a spread not only of table games at card clubs, but of the use of a management bank system in violation of the state compact granting exclusivity to native American casinos. 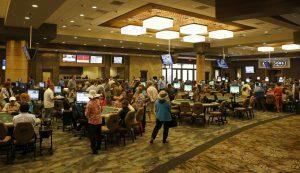 With 74 card rooms operating in California, Shimazu said regulators will give operators notification of their intent. What seems like a logical step by her office is already creating controversy on both sides of the issue. Tribal leaders are wondering what took so long and suspect any determination by the state may wind up being more of a wrist slap than a corrective action. Card clubs, Hendricks said, have been increasingly brazen in allowing prohibited games such as blackjack and pai gow poker. The card clubs, however, argue that any decision making that impacts their branch of the gaming industry should be heard in public and properly vetted. By common practice, the card rooms essentially rent space to pre-approved third-party dealers whose companies act as the games’ bankers. Restrictions exist on the kinds of games those dealers can offer, but times and player tastes are changing – as is the political atmosphere. The greater concern, Hendricks noted, and others echoed at G2E, was the increased political interest in reshaping the compacts in what he feared was an attempt to violate tribal exclusivity. While tribal governments’ political clout is heavy in Sacramento, conservative political trends nationally have questioned basic sovereignty rights in Indian Country. Card room supporters argue that the business employs more than 20,000 workers and brings in more than $250 million in tax revenues. Its contributions make up an integral percentage in the budgets of several municipalities. That sounds like a fitting argument against cracking down on the card rooms. No one wants to be responsible for layoffs of police, firefighters and public schoolteachers. But it also begs the question of whether state gaming regulators have been doing their duty. One issue that doesn’t seem in question: The card room challenge promises to test the strength of the state’s relationships with the tribes and the value of the compacts that granted them casino exclusivity. No matter the eventual outcome, the financial bottom lines of tribal and card club operations figure to take substantial hits until the issue is resolved. The legal fees promise to be enormous as the battle heads to civil action and the court of public opinion.